When you’re providing clients with marketing services, there’s nothing more exciting than presenting them with good results. You’ve done a lot of hard work to get to this point. You’ve taken a few risks, but your expertise and insights are finally paying off. It would be a shame if a mistake on your report only leads to client confusion, instead. By 2020, the percentage of marketing budgets spent on data analytics will increase to 22%. That’s up from just 4.6% in 2017. The rapid investment in marketing analytics is related to an age-old industry problem. Marketers must continuously show ROI, both to their clients and to their superiors. Businesses spend a lot on marketing. Global spending on media alone is expected to reach $2.1 trillion in 2019. But with so many marketing channels available, it’s harder than ever to show how every dollar spent correlates to revenue and growth. For marketing agencies, reporting results to clients is a crucial moment. There’s no room for mistakes. Read on to learn how comprehensive client reporting can help you grow and how you can avoid the most common reporting mistakes. Likely, you’ll be reporting to executives or decision-makers. You may even be reporting to a CMO. The choices these leaders make will determine whether you grow or remain stagnant. Not only is reporting your best opportunities to shine with clients, but they’re also your best opportunities for growth. By providing client reports and discussing them, you can offer new services to clients, earn referrals, upsell, and lock-in even more lucrative retainers. But most importantly, client reporting gives you the opportunity to solve your clients’ problems. Solving problems is perhaps the best way to differentiate yourself in the market. According to a study by Rubin Postaer and Associates and USA Today, 90% of agencies said they truly understood their clients’ businesses. But on the other side, only 65% of clients agreed. Furthermore, most clients from the report (56%) said their agencies were more interested in selling than solving client problems. Showing ROI to clients through reporting isn’t just a way to prove your worth. It’s a tool you can use to identify your clients’ challenges, address them, and foster more growth. Nonetheless, every agency runs into trouble when sharing marketing reports with clients. A simple misunderstanding can sometimes lead to disastrous consequences. Communicating can be challenging. It’s a skillset that can be taught and learned. That’s why many agencies have dedicated account managers. But your entire marketing team may be involved in how your reporting turns out. You may need different channel experts to sit in on client meetings if you want to discuss specific strategies. For these reasons, most of your team should be in the loop when it comes to client reporting. You should also work to foster some basic communication skills within your company. Soft skills like active listening, open-mindedness, diction, and clear pronunciation can go a long way in your reporting meetings. You should also train your staff on what not to do when communicating with clients and when creating marketing reports. Here are a few client reporting mistakes you should avoid so you can better maintain your relationships with marketing clients. You want your clients to be successful. Their success is related directly to your own. For this reason, it can be tempting to paint a pretty picture in every client report. But if you’re only focusing on the good news, you’re sweeping your client’s challenges under the rug. Clients will always prefer the truth over cherry-picked results. When you share the bad news, you foster a more transparent relationship between you and your client. Furthermore, you open a chance to identify opportunities and brainstorm new ideas. First, pick the right key performance indicators to share with your client. For example, it might be great that their web traffic has increased by 5%. But if conversions and new customers have dropped, you may be drawing in the wrong type of traffic. You can look at it at a granular level, too. How much time are those new visitors spending on your client’s website? What pages are the viewing, and how many pages are they looking at before they leave? What is their entry point? How can you make your calls to action more persuasive? These are the types of discussions you could be having with your client if you report the whole story. But remember, your client may be more interested in high-level information. Just be sure you can offer solutions when the numbers are down. Some clients will be more hands-off than others. It’s great when you can take control and steer a client’s marketing the way you see fit. But just because your client doesn’t want to have long phone conversations, that doesn’t mean they don’t need reporting. In some cases, your client may be quiet for several weeks. You may think everything is going fine until your client gives you a call suddenly to ask what you’ve done for them lately. Reporting consistently means making two commitments: Providing your client with reporting at regular intervals and being consistent with the format of those reports. Your client should expect to receive marketing reporting at specific times and dates. A good practice is to find a day and time of the week that works for both parties and schedule recurring meetings on that day. Your client may wish to receive weekly reporting or only meet quarterly. But you should always give your client 24/7 access to a marketing dashboard. The dashboard provides them the opportunity to view their results on their own time. They’ll be more informed, so your regular meetings will go more smoothly. Regarding formatting, keep client expectations in mind. If you provided them with one format last month, they’ll probably expect the same this month. When you first begin a relationship with a client, they may voice how they want things to look a year, two years, or even five years down the road. In some cases, they may not know what they want. They’ll know they need marketing, but they may need you to give them a roadmap. Either way, you’ll document high-level goals at the beginning of your client relationship. These are the goals that will steer your campaigns. Nonetheless, it’s easy to lose sight of these goals, especially when you’re examining your campaigns on a granular level. For example, a social media campaign may have earned your client plenty of new followers. That’s great news! But what if those followers aren’t turning into leads? If your client’s goal is to increase social lead generation by 5%, you can’t connect them to your high-level goal — at least, not yet. Furthermore, you should always remember the real purpose of marketing: customers, revenue, and profit. Earning website traffic, backlinks, brand exposure, and even leads are all great. But if you can’t connect those things to real business, your client won’t see a return on their investment. Let’s face it. People don’t have a lot of time these days. It can be hard enough to schedule time for a phone call, let alone put enough time aside to go line by line through a lengthy report. Your clients may want detailed reporting, but you should always provide them with something that’s easy to digest. Your client may not care as much about granular data points as they do about money coming in. They may only be interested in high-level information like leads, new customers, and revenue. Follow some basic content practices when making client reports. Break up sections by headers. Use short paragraphs, bullet lists, numbers, and charts to relay information. Don’t rely on lengthy explanations when a list will do. If your client wants to focus on specific campaigns, you can include more in-depth information. For example, if you’ve been working extensively on their blog performance, blog traffic and new subscriber growth may interest them. Data visualizations are one of the most effective tools in your reporting arsenal. If you’re still relying on spreadsheets to relay your marketing numbers, you’re missing an opportunity to dazzle your client. Your visualizations may only need to take the form of charts and graphs. 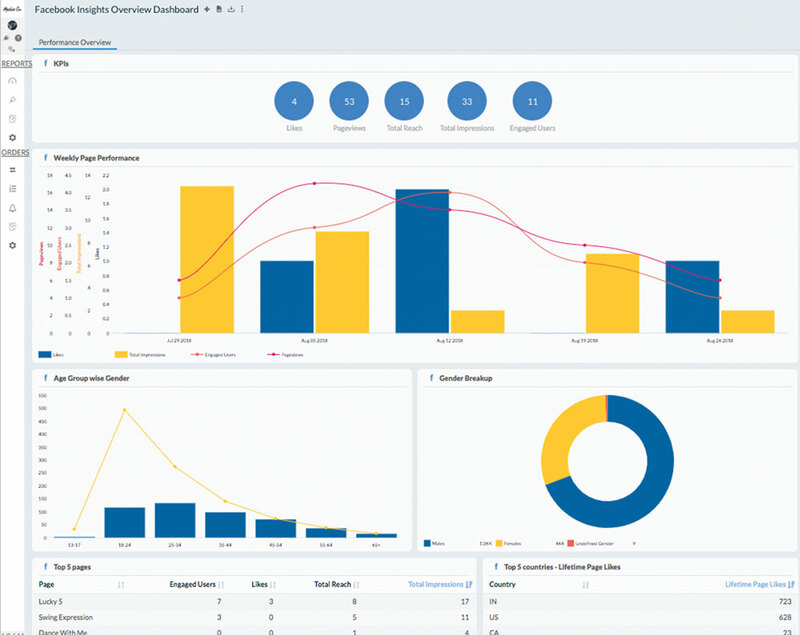 If you have automated marketing analytics tools, your client may even be able to see data visualizations in real-time through an online marketing dashboard. Data infographics like this can provide your clients a different perspective on their campaigns. Most importantly, it’s easy to digest and understand. Your client will appreciate the fact that you’ve prepared the data for their consumption. They’ll also be impressed by the quality. You don’t need to make marketing reports from scratch every time. In fact, you may be doing your clients a disservice in doing so. Generating reports automatically is a great way to maintain consistency. It can also help to free up your team to focus on other tasks. You can get automated reporting with the right analytics tools. You can then set the system to produce a report at certain times, making it easy for you to prepare for client meetings in a snap. What Should Client Reporting Look Like? These days, client reports need to be educational as well as informative. You need to connect with your clients on a personal level. Make sure they understand the value you bring them. But you should also let them know you understand their challenges. Then, you can offer proactive solutions to keep them looking forward. You should also be open to change. Don’t burden clients with your process. They may want to do something different, so you should try to be as flexible as possible. That said, always remain consistent. Make sure your reports are easy to understand and the formatting doesn’t deviate from one month to the next. If possible, give your clients access to a marketing dashboard so they can check in anytime. Stick to a basic meeting structure when presenting reports to clients. Start with background information to establish context. Report on progress and wins, then move on to challenges and recommendations. Finally, summarize your report, leave some time for conversation, and document next steps with your client. Don’t miss out on a chance to stand out with client reporting. With the right tools, you can create dazzling marketing data visualizations and concise reports that your clients can’t wait to read over. With a solution like TapClicks, you even have access to over 1400 channel integrations. That means your clients can integrate any tools your clients use into the platform. Sign up for a free trial of TapClicks now. Spend less time gathering data and more time making your clients happy.